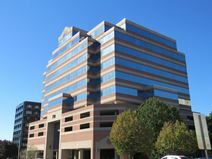 Located just steps from the shopping and dining options of Stamford"s Harbor Point district, this 13,000 square foot. co-working office environment also has an extensive range of private and executive working spaces available on-site for all types of corporate prospective tenants and is an ideal office solution for both remote and mobile workers, and project teams alike. Widely renowned and easily accessible, this is an ideal corporate setting for all professionals. This award-winning Class-A business centre in buzzing Stamford provides a full range of furnished executive suites and tremendous views of Long Island Sound. Clients benefit from sophisticated conference rooms, cutting edge technology and support staff. Each office profits from easy access to Routes 1, 124 and I-95, as well as transportation links to New York City and the surrounding area. This business professional center is in a prime location near downtown. Fully furnished offices and flexible terms make this center ideal for any size business. Centered near the local Amtrak Station in Stamford. On-site management team provides support to ensure that your company is able to focus on growth. On-site gym adds convenience for employees and guest looking to get a quick workout session in. Featuring tailored services for clients and an impressive selection of executive and virtual suites, this remarkable business centre is all-inclusive. Each client receives secretarial support, access to state-of-the-art conference and videoconferencing facilities, as well as the latest internet technology. Fantastically situated in Stamford’s thriving business district, these suites have easy access to a vast array of shops and restaurants, Merritt Parkway, and trains to New York City. Set in a sleek, all-inclusive complex, this business center provides an impressive number of fully equipped and luxurious executive suites. Services on offer include state-of-the-art technology, an on-site fitness center, movie theater, shops and restaurants. Clients will benefit from this exclusive location in downtown Stamford, just moments away from Stamford Town Center and transport links to New York City. Office space available at this business centre located in downtown Stamford close to the Sheraton Convention centre and to nearby hotels and restaurants. This facility offers suites for up to 5 persons and lots of privacy. Luxurious executive suites now available in Stamford’s elite business area. Each office to lease capitalizes on the striking architecture and fantastic location near Manhattan and New York’s major airports. These suites offer the best in internet technology and all modern amenities. Professional office space is immediately available in this serviced business centre, offering superb facilites and breathtaking views. Conveniently close to shops, restaurants, bars and hotels, as well as excellent public transport connections including Stamford train station. The regional transport links are also excellent and offer a multitude of convenient travel services in operation throughout the immediate locality and wider region.